Users in Datto RMM are individuals set up with a user account. 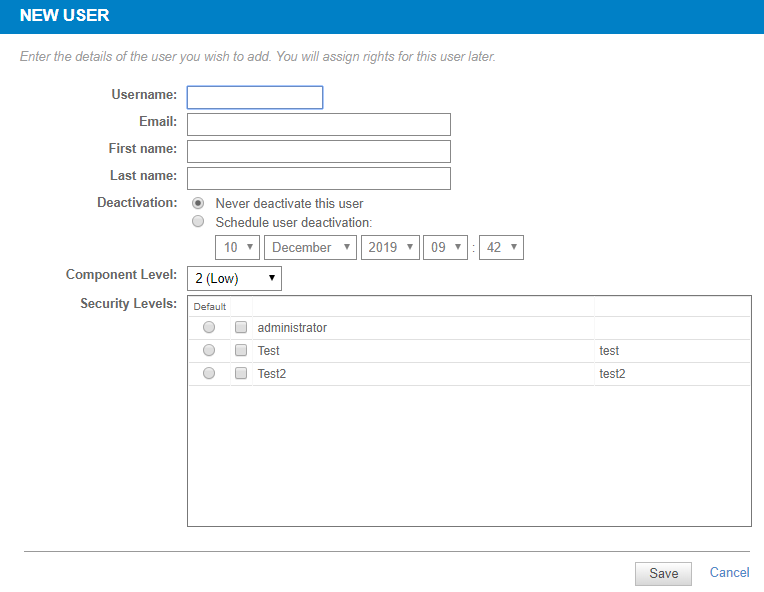 You can add and manage users and review the user activity log on the Setup > Users tab. The Users view displays a list of all users that have been set up in your Datto RMM account. Here, you can add and manage users. The Activity Log view is a log of all user activity performed in both the Web Portal and Agent Browser. You can view, filter, search and export the log or parts of it. Refer to User activity. By default, the Users view is displayed. Selection check box Click the check box in the header row to select all rows, or click one or more rows to perform an action. Username Click the Username hyperlink to open the User Details window. Refer to Edit a user. Name First and last name of the user. Deactivation Indicates whether the user account is set to expire on a certain date at a certain time. Refer to Deactivation. Security Levels Lists all security levels that are associated with this user. Component Level Determines which components can be viewed by the user. Refer to Component Level. Administrator A toggle that will instantly add or remove the user's Administrator access. Refer to Security levels. Toggle inactivate/activate user Refer to Inactivate or activate a user. View user activity Select one or more users and click the icon. You'll be directed to the User activity page. Reset 2FA status Refer to Reset 2FA for one or more users. Export to CSV Allows you to export a list of the selected users and their attributes in .CSV format. Make sure to select/deselect the columns you want to include/exclude in the export. (All columns are selected by default.) Passwords and API Secret Keys are not exported. In the Search field, start typing a Username or Name. As you type, the search results are narrowed to match your search string. To display the full list, delete the search criteria. Click New User on the left of the page. Username Enter a unique username, such as firstname.lastname@mycompany.com. The username must be unique not only on your platform but across all platforms. Best practice is to use an email address. Password Pick a strong password. Refer to Strong password requirements. Confirm Password Enter your newly created password again. Email Enter the user's email address. First name, Last name Enter the user's first and last name. 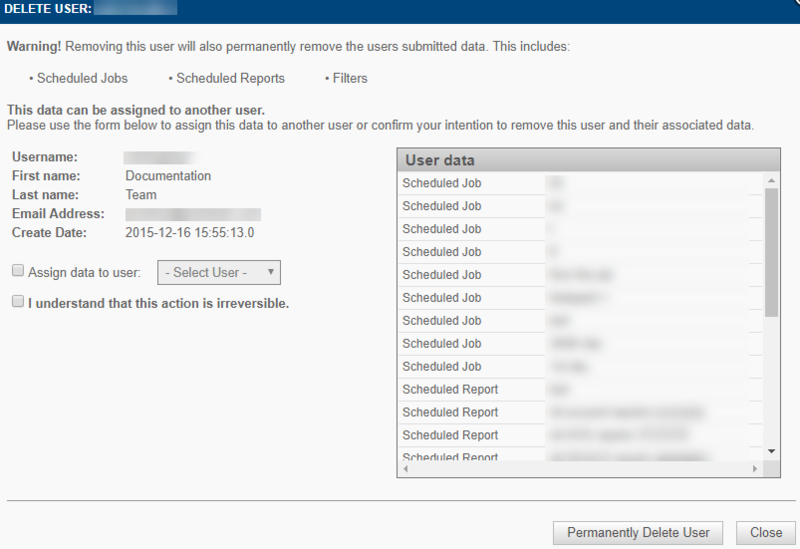 • Schedule user deactivation - Specify when you want the user account to expire. Select a date and a time. Component Level Determines which components the user can view in the Component Library when clicking on the Components tab. Refer to Manage components. Select a number between 1 (Basic) and 5 (Super). For example, a user who has a Component Level of 5 will be able to view all components when clicking on the Components tab, while a user with a Component Level of 3 will only be able to view components with a Component Level of 3, 2, or 1. Security Levels Select the user's default security level by clicking on the radio button. The default security level will automatically be assigned to them when they log into the Web Portal. You may assign a user more than one security level by selecting the check box next to another security level. This will allow them to switch between security levels in the Agent's menu options or within the Web Portal using the security level drop-down menu next to their username. For more information on managing security levels and how to add new ones, refer to Security levels. User details or credentials will not be emailed to the user. Click on the Username of the user you wish to edit. The User Details page will open. Edit the user details. For field descriptions, refer to Add a user. To assign a new password, you can simply enter one into the Password field, or click the Generate random link. Refer to Change another user's password. The new password is not automatically sent, so you should inform the user. To enable or disable Two-Factor Authentication, refer to Two-factor authentication. 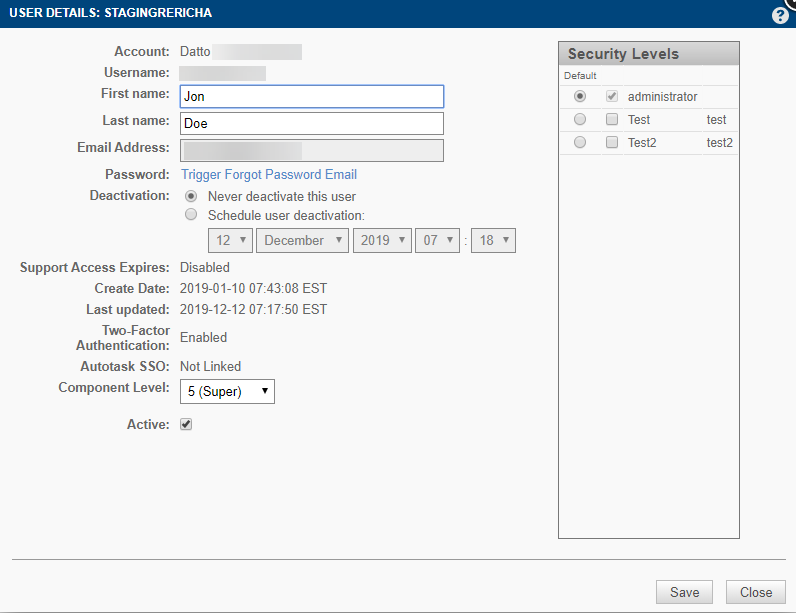 If your Datto RMM account has been integrated with Autotask PSA and the single sign-on option has been enabled, the Single Sign-On field will be displayed on the User Details page to indicate whether the user account is Linked or Not Linked to a PSA user profile through single sign-on. If you hover over the word Linked, the PSA user ID will be displayed. To unlink the user account from the PSA user profile, click the Remove Link hyperlink. For further information about single sign-on, refer to Configure single sign-on. If access to the Datto RMM API has been enabled for your Datto RMM account, you will see API-related fields on the User Details page. You can generate or regenerate and delete the API keys. For more information, refer to Activate the API. To inactivate the user, uncheck the Active check box. Select the user(s) in question and click the Toggle inactivate/activate user icon from the Action bar. Confirm whether you want to inactivate / activate the user(s). In case you have just inactivated the user, note the Inactive icon displayed next to the user's name. Click on the name of the user you wish to edit. Uncheck or select Active in the User Details window. The third option is to inactivate a user on a certain date in the future. Refer to Deactivation. The Delete user icon becomes visible when you hover over a user. Click the icon and a pop-up window appears that displays the user's details as well as a list of their associated data. Associated data includes scheduled jobs, scheduled reports, filters, tickets, ticket monitors, or ticket notes. The user's associated data will also be permanently deleted unless it is first reassigned to another user. Select the Assign data to user check box on the pop-up window, and then select a user from the drop-down list. Select the I understand that this action is irreversible check box and then click the Permanently Delete User button. If the deleted user's associated data was reassigned, it will be available in the new user's account. Otherwise, it will be permanently deleted along with the user.